"We didn't have to go back into business, but we couldn't stay away. When it comes to designing and building custom helicopter interiors and modifications, few firms can match AeroBrigham. Operating out of a 15,000-square-foot hangar at Texas' Decatur Municipal Airport, AeroBrigham is renowned for the uniqueness and quality of its custom helicopter and medium fixed-wing projects -- and the speed with which they win regulatory approval from the local Federal Aviation Administration (FAA) Flight Standards District Office (FSDD). "We have an amazing relationship with our FSDD and a history with them of getting field approvals for things that our competition is either afraid to try or unable to get, because of their relationship with the FAA, experience level of the FAA's confidence level in them," said Dave Brigham, president and co-owner of AeroBrigham (along with his brother, Danny). "Another thing that truly sets us apart is we're not afraid to take on any job no matter how small or large, and that we also have a reputation of delivering on shorter schedules than most of our competitors." There's a very good reason why the Brigham brothers can hit all these high notes: They have a massive legacy of experience in the helicopter industry. In fact, Dave established United Rotorcraft Solutions (URS) in February 2005, with his brother Danny joining in later that year. Initially opened to provide night vision lighting system service to helicopter operators, URS soon grew to become a full-service helicopter and fixed-wing completions and service center. It grew so fast and successfully that Air Methods bought URS from the Brigham brothers in 2011. "After selling URS and taking some time off we got the itch to start up something bigger and faster," said Danny Brigham. "So we cashed in our retirement funds to start AeroBrigham, and here we are today." With over 30 years of experience each, and backed by a small team of similarly expert technicians, the Brighams can indeed get helicopter modifications through their local FSDD with a minimum of fuss. "We do our homework before we apply for a field approval or STC [supplemental type certificate] from the FAA," said Dave. "We know what kind of data the FSDD or ACO [aircraft certification office] needs in order to issue an approval, and we make sure it is all there when we submit the application." AeroBrigham's combination of know-how and creativity allows the company to make custom modifications for its many customers. 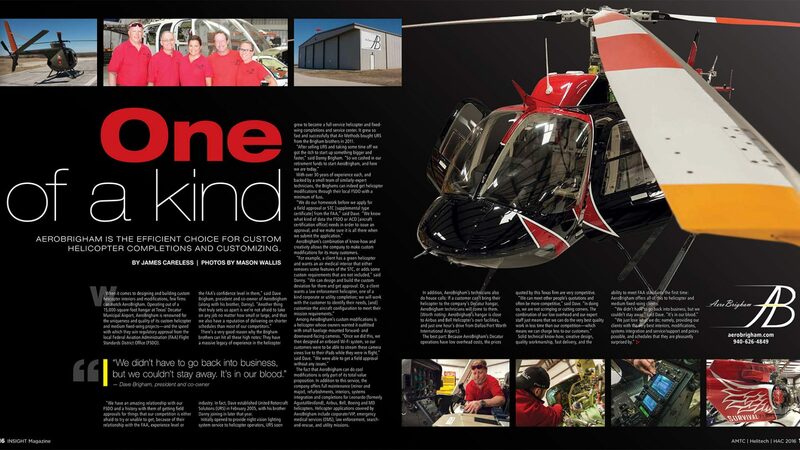 "For example, a client has a green helicopter and wants an air medical interior that either removes some features of the STC, or adds some custom requirements that are not included," said Danny. "We can design and build the custom deviation for them and get approval. 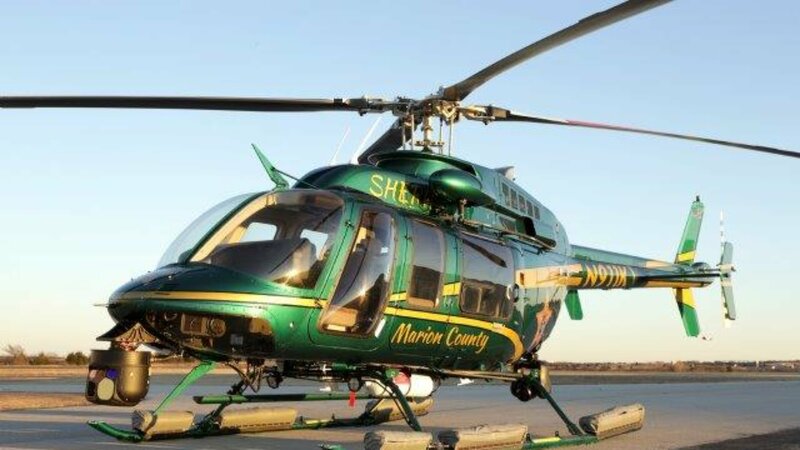 Or, a client wants a law enforcement helicopter, one of a kind corporate or utility completion; we will work with the customer to identify their needs, [and] customize the aircraft configuration to meet their mission requirements." Among AeroBrigham's custom modifications is a helicopter whose owners wanted it outfitted with small fuselage-mounted forward- and downward-facing cameras. "Once we did this, we then designed an onboard Wi-Fi system, so our customers were able to stream these camera views live to their iPads while they were in flight," said Dave. "We were able to get a field approval without any issues." The fact that AeroBrigham can do cool modifications is only part of its total value proposition. In addition to this service, the company offers full maintenance (minor and major), refurbishments, interiors, systems integration and completions for Leonardo (formerly AgustaWestland), Airbus, Bell, Boeing and MD helicopters. Helicopter applications covered by AeroBrigham include corporate/VIP, emergency medical services (EMS), law enforcement, search-and-rescue, and utility missions. The best part: Because AeroBrigham's Decatur operations have low overhead costs, the prices quoted by this Texas firm are very competitive. "We can meet other people's quotations and often be more competitive," said Dave. "In doing so, we are not scrimping or cutting corners. The combinations of our low overhead and our expert staff just means that we can do the very best quality work in less time than our competition -- which means we can charge less to our customers." Solid technical know-how, creative design, quality workmanship, fast delivery, and the ability to meet FAA standards the first time: AeroBrigham offers all of this to helicopter and medium fixed-wing clients. "We didn't have to go back into business, but we couldn't stay away," said Dave. "It's in our blood." "We just love what we do; namely, providing our clients with the very best interiors, modifications, systems integration and service/support and prices possible, and schedules that they are pleasantly surprised by."